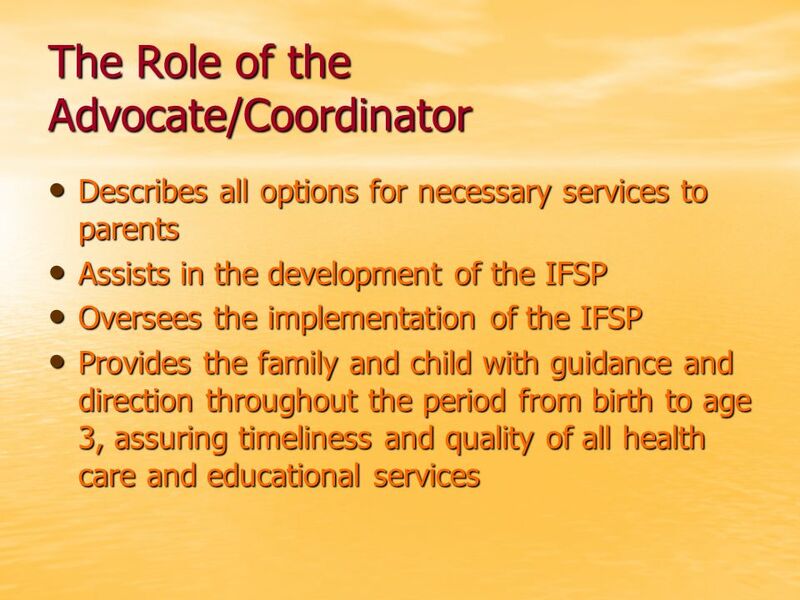 4 Individualized Family Service Plan (IFSP) Each state should provide the family of an infant or toddler with hearing loss with a detailed IFSP that lists a timely, effective, and coordinated program of health care and educational services in the locality of the childs home. 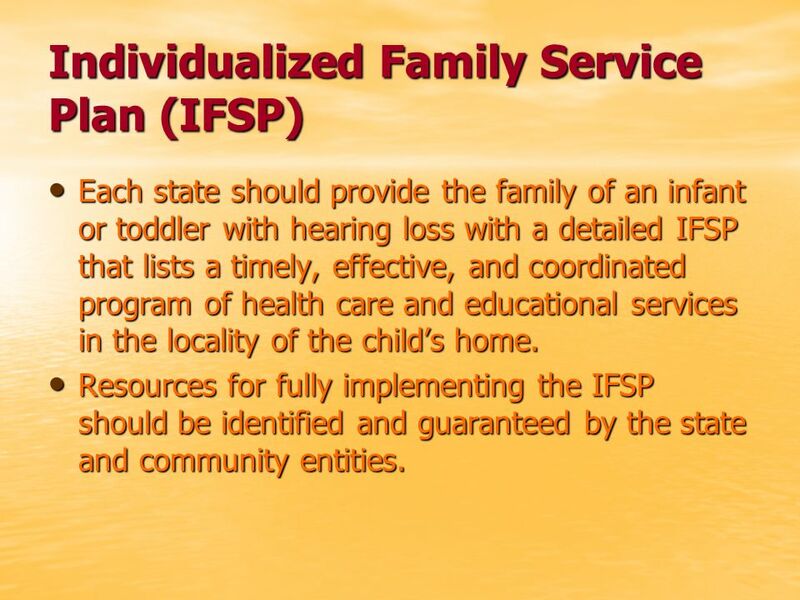 Each state should provide the family of an infant or toddler with hearing loss with a detailed IFSP that lists a timely, effective, and coordinated program of health care and educational services in the locality of the childs home. Resources for fully implementing the IFSP should be identified and guaranteed by the state and community entities. Resources for fully implementing the IFSP should be identified and guaranteed by the state and community entities. 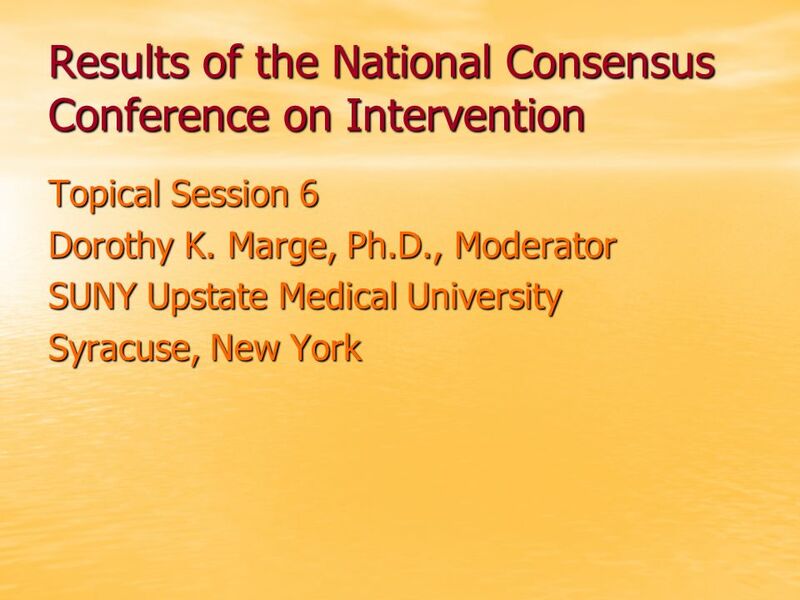 Download ppt "Results of the National Consensus Conference on Intervention Topical Session 6 Dorothy K. Marge, Ph.D., Moderator SUNY Upstate Medical University Syracuse,"
EHDI Systems and the Medical Home Carlos Quezada-Gomez, PsyD National Center of Medical Home Initiatives for Children with Special Needs American Academy. Is Early Intervention Necessary for All? Ruth Fox, RN, MS, New Hampshire EHDI Program Coordinator Mary Jane Sullivan, Au D, New Hampshire EHDI Consulting. 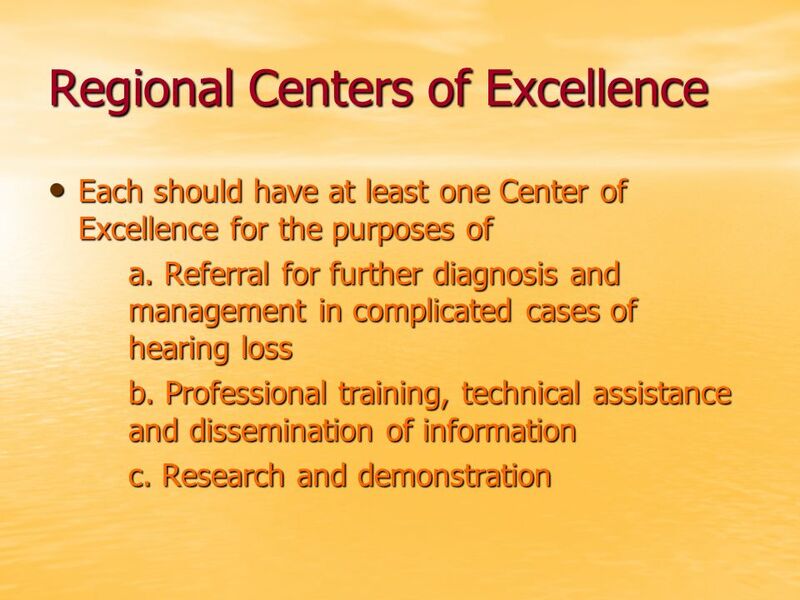 CDC EHDI RESOURCES for States. CDC EHDI Website CDC EHDI Website Purpose: To provide up-to-date. Evaluation of EHDI Programs Terry Foust Karen Muñoz Kathleen Watts NCHAM Technical Assistance. Regional Infant Hearing Program REGIONS IX and X Cleveland Hearing & Speech Center and Family Child Learning Center. National EHDI Meeting EHDI-Related Efforts in the Office of Special Education Programs (OSEP) Lisa Holden-Pitt Education Research Analyst Research to Practice. 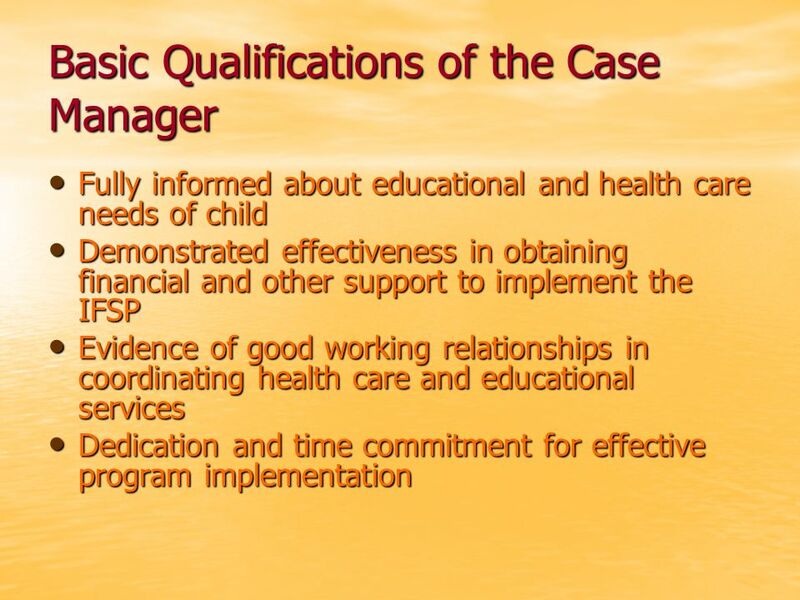 Western States Early Intervention Outcomes Project Kathryn Kreimeyer, Ph. D. Shirin Antia, Ph. D. Tucson, Arizona Arlene Stredler Brown, CCC-SLP, CED Allison. HEAR OUR VOICES. Family Centered Best Practice Model and the IDEA The Parents Right to Receive Unbiased Information on Communication Options. EARLY START Federal and State Requirements. What Is Early Start Frequently asked Questions Frequently asked Questions Which children are served? What. Presentation to: Title I Program Conference & Annual Homeless Liaison Conference Presented by: Ruth Cantor, Program Consultant, Babies Can’t Wait Erica. Community Presentation. Child Find is a process to “find” children who may have a delay in development or a disability. P re-Referral and Referral Activities Produced by NICHCY, 2014 Module 3. 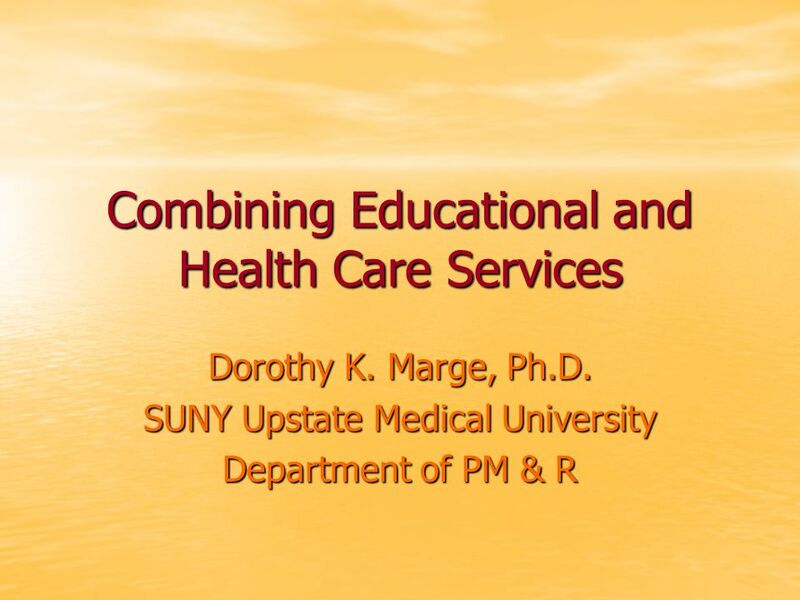 Office of Special Education & Early Intervention Services Webinar—General Information Training will begin in a moment; all phone lines are currently muted. Resources for Special Needs Kids Kathy Bohanon, MD CASA Advocate, Pediatrician. July 2013 IFSP and Practice Manual Revisions April 29, 2013 May 3, 2013 Infant & Toddler Connection of Virginia Practice Manual Infant & Toddler Connection. 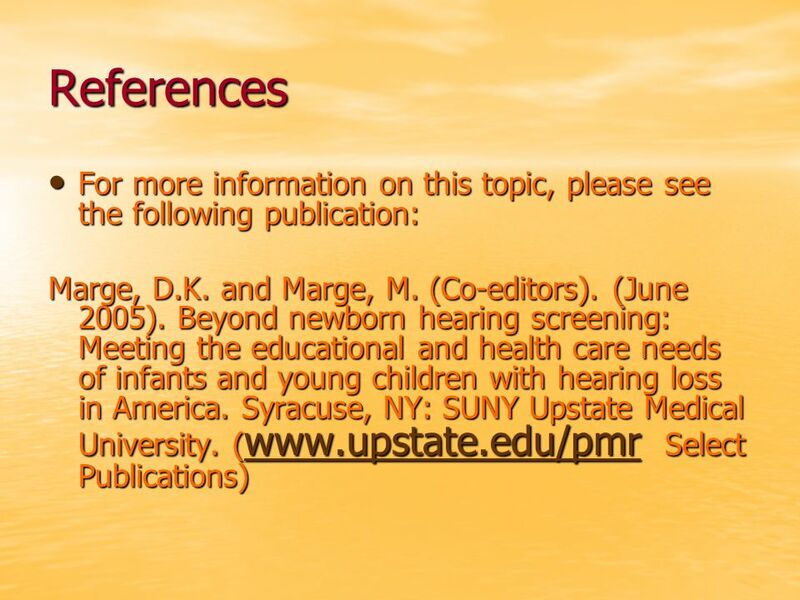 Healthy Child Development Suggestions for Submitting a Strong Proposal. 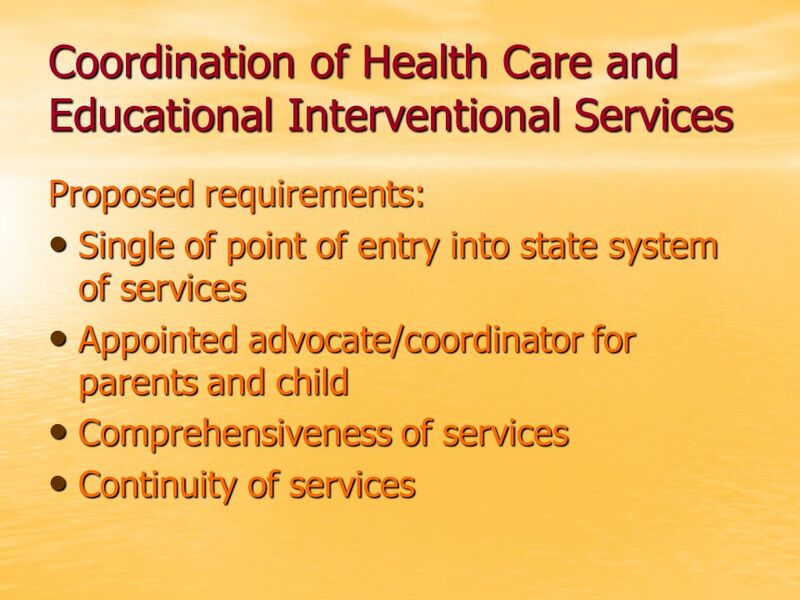 Healthy Inclusion: Caring for Children with Special Needs in Child Care © The National Training Institute for Child Care Health Consultants, 2013 1.